In bowl combine the sliced strawberries, whole strawberries, rum and sugar. Toss well. Place in the fridge and allow to sit at least 1 hour or up to 2 hours. Grease an 8x8-inch square baking pan. Add the mascarpone, heavy cream, powdered sugar and Kahlúa™ to a bowl. Using an electric mixer, whip the mixture until stiff peaks form. Lightly dip the tops of each ladyfinger into the coffee and place in the bottom of the prepared pan. Gently spread half of the mascarpone mixture onto the ladyfingers. 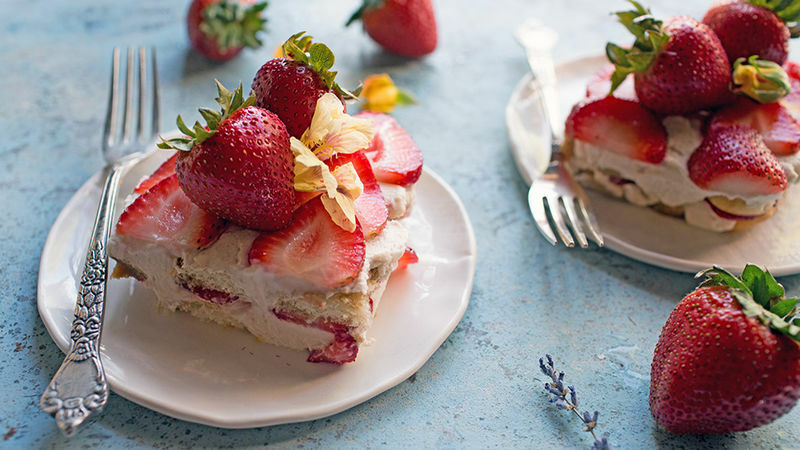 Arrange half of the sliced strawberries over the mascarpone layer. Repeat the layer one more time, ending with a layer of strawberries. Cover and place in the fridge for 2 hours or until ready to serve. Reserve the remaining whole strawberries for serving. Slice the tiramisu into 4-6 pieces and top each with a strawberry. Enjoy! This recipe would work great with any type of fresh berries or even cherries. For a fun twist, try using glazed doughnuts in place of the ladyfingers. 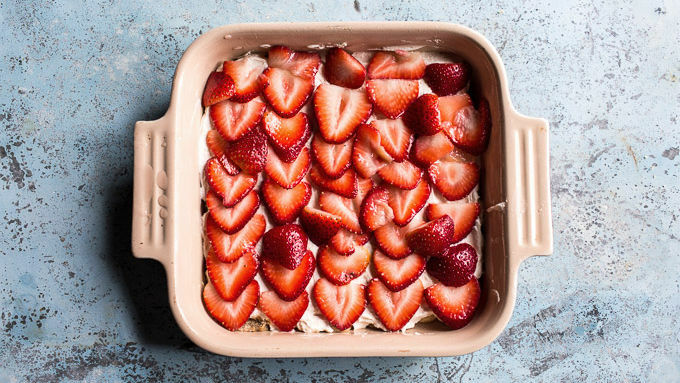 Summer means strawberries, which go great with tiramisu—especially when they’re soaked in rum!Ok, ok, ok! So how pretty is this tiramisu? I have to admit that I’m a sucker for pretty food. I mean, I LOVE really delicious food, but let’s be honest—sometimes the best foods just don’t look all that pretty, you know? So when I have a recipe that is both amazingly delicious AND pretty, I get a little overly excited. Forgive me for all the exclamation marks, I just cannot help it!! So aside from this tiramisu looking beautiful, it’s also so yummy!! 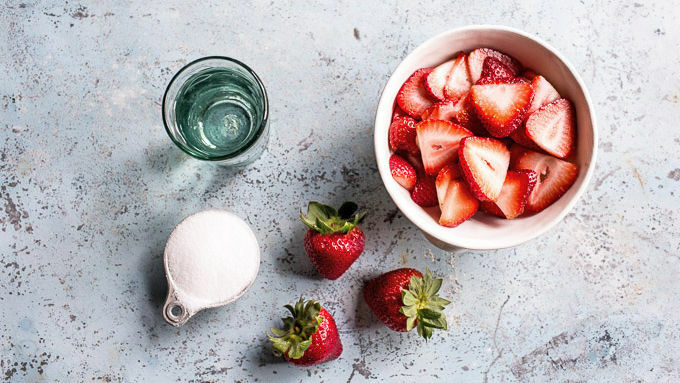 For starters, those strawberries get soaked in rum. 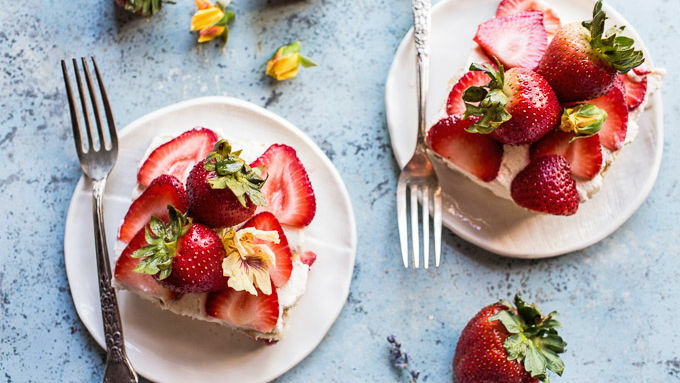 Seriously, can you think of a better way to enjoy summer berries? 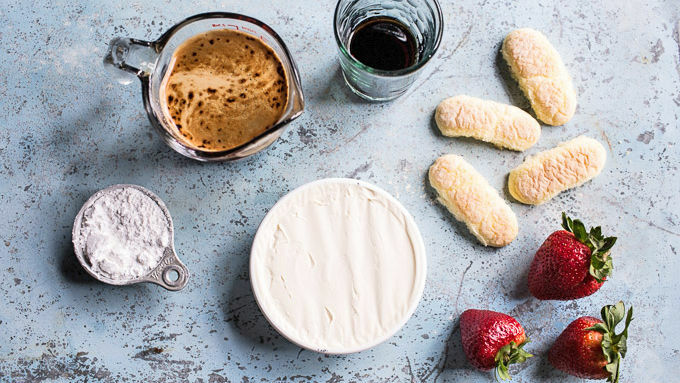 Next up, the rum soaked strawberries get placed on top of ladyfingers that are lightly dipped in coffee and covered with Kahlua™-spiked mascarpone. This recipe would work great with any type of fresh berries or even cherries. For a fun twist, try using glazed doughnuts in place of the ladyfingers. All I have to say is YUM. So much YUM! Slice the tiramisu into 4-6 pieces and top each with a strawberry. Enjoy!